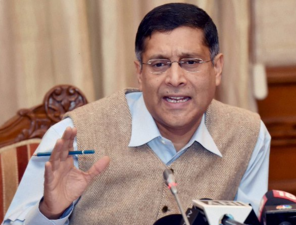 New Delhi, Dec 4: The committee on the goods and services tax headed by Chief Economic Advisor Arvind Subramanian on Friday recommended a revenue neutral rate range of 17-18 percent for the proposed GST. The revenue-neutral rate is that single one that “would preserve current revenues”, that is, at which there will be no loss to both state and central governments. “The revenue neutral rate is a range and the committee suggests it as between 15 percent and 15.5 percent,” Subramanian told reporters here while making a presentation of the report submited to Finance Minister Arun Jaitley. “The range for the key standard rate will vary between 17 percent to 18 percent, depending on the choices made on (tax) exemptions and how precious metals are taxed,” he said. “The key standard rate will translate into a structure of rates…a low one of 12 percent, as well as a high rate of 40 percent for things like luxury products,” he added. He also said the committee has recommended “eliminating all taxes on inter-state trade, including the one percent additional tax”. The GST Bill, which seeks to usher in a pan-Indian common market by reforming the country’s indirect tax regime, was passed in the Lok Sabha in May, but has been opposed in the Rajya Sabha, where the ruling NDA does not have a majority. Opposition parties want the government to remove the 1 percent additional tax aimed to benefit the “producing states” like Gujarat and Tamil Nadu. Minister of State for Finance Jayant Sinha said last week that the central government is seeking a consensus on the vexed issue. Subramanian said GST will “strengthen the country’s tax institutions, get rid of barriers within states and create a common market”. “India’s GST is very ambitious. It can be the gold standard for VAT (value added tax) systems for large federal systems,” he added. Earlier on Friday, Finance Minister Jaitley said fixing an 18 percent cap on the GST rate in the proposed constitutional amndment bill as suggested by the Congress would lead to a situation of being unable to raise taxes on a host of “sin” products and luxury goods. “There are sin products (alcohol, cigarettes) that need to be taxed high. There are polluting products and there are luxury items that should attract higher taxes,” he said answering queries at the Hindustan Times Leadership Summit here. The Congress maintains that the GST rate should be capped at 18 percent in the constituional amndment bill. India Inc on Friday welcomed the report of the Subramanian committee. “FICCI welcomes the recommendations put forth by the GST panel today (Friday). The industry has been looking forward to this report and (it) puts to rest the taxpayers’ anxiety on the expected rates and many other issues relating to GST regime,” A.Didar Singh, secretary general of the Federation of Indian Chambers of Commerce and Industry (FICCI) said in a statement here. He said GST is expected to add about 2 percent to the GDP and will accrue long-term benefits not only to government, industry or traders but to the final consumers as well.